There’s a lot of misinformation out there about how to best hold your paddle up at the net. We’ve heard some coaches explain it in a way that we agree with but we’ve also heard many say things like “hold the pace up high” and we’ve also heard “hold your paddle in a full backhand position”. We don’t agree with either of these. We think that moderation is key. In this video, we cover the best position in which to hold your paddle when all 4 players are up at the net and you need to be ready for an attack from your opponents at a moments notice but you also need to be ready to attack right away if the opportunity presents itself. The position we recommend leaves you in good position to be able to do both and get the best of both worlds. This questions comes up a lot… where should you’re ready position be and where should your paddle be when you are in the ready position. Now, if all four players are up at the net, there’s only 14 feet between you or your partner and the opponents. So the game could be slower if you and your pattern are back aug the baseline but things start to speed up very quickly when you’re up at the net and especially if they are also up at the net. So, to be clear, this is specifically for the scenario when all four players are up at the net. The questions is, how do you position your paddle? Also where, meaning how high or low, should you hold your paddle, and also, how should you’re ready position be. These are questions that come up a lot. Many players coming from a tennis background or other racket sports, they like to keep their paddle straight and up with the edge guard facing their opponent. Basically the paddle is even with one edge guard facing directly up and the other facing directly down, with the tip maybe slightly up. Basically the face of the paddle is perpendicular to your body even though the tip will be angled up. And there’s other people that really like cheating ALL the way to their backhand with the paddle face almost totally parallel to their body toward the backhand side. I find the most effective place to hold it is only slightly favoring the backhand. When you watch top level play, you’ll see that most pros do it this way. The reason we like to slightly favor the backhand is because when we’re up at the non volley zone line, and we’re dinking and the game gets fast, most of the balls that are going to be attacked, are going to come towards you body or at your feet. All good players are going to go right at your feet or at your body to jam you up. The court is relatively small so there not that much space to go around you and the other thing is that if they can’t make you reach then they give you good space to be able to hit the ball. The best bet is to try and jam you up. It’s really tough to defend your body with your forehand, you really just can’t do it because you arm can’t come across your body in that direction. It’s an awkward position and you’ll end up posing it up or just missing the shot. So if you’re trying to defend your feet, your body, your face or your shoulders, it’s best to do that with your backhand side. You’ll be hitting most blocking shots with your backhand therefore it only makes sense that you favor it slightly when you are receiving the ball. 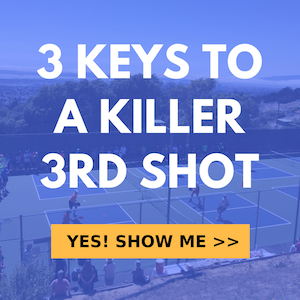 If it comes fast, your ready to defend and if it comes slower than you have time to take it with your forehand if you want but you always need to be ready to defend first and since that happens with your backhand…hold it slightly to your backhand. Another thing we see is that many players put their paddle way up high in the ready position which doesn’t make a whole lot of sense when many attacking balls are going to be aimed at your feet. That’s why you want to hold it around waist level. You’ll see most of the top players hold it at around waist or navel level because that puts them in the best position to defend there body and if needed, they’re feet. If they expect it will come low they will also get low in the knees. So, after every shot you’ll want to bring that paddle back to ready position near your waist and slightly tipped towards the backhand. Check out the video up top to get really good visuals on how it should be done.